Welcome, faithful readers (and those of you joining us for the first time) to another installment of Cover Stories, a weekly column in which I, Jon B. Knutson, present a group of covers with a common theme! Before we get into this week's theme, though... it's time to dip into the mailbag! After column #118, in which I talked about the origin of Superman villain (and Captain Marvel analogue) Zha-Vam, one of my faithful readers stepped in to correct my misremembering of Zha-Vam's origin! Just read this week's column, and was as amused as ever to see the classic SA transformations. Silly they may have been, but an awful lot of writers of modern comics could do with learning a few things from them about how to write entertaining stories instead of the dreck we get these days! Back to the column, though. I remember the Zha-Vam tale -- unusual for DC in those days in being a continued story and not all neatly wrapped up in a single issue or less -- and, as I recall, Jon is wrong about why the bearded trouble-maker showed up to make Superman's life as unpleasant as possible; it didn't have anything to do with Lois, though an oracle's pool was involved. You see, the gods (mostly the Olympians, although, in classic comics fashion dating back to at least the origin of the Big Red Cheese, they were a mixture of Greek and Roman deities with a few thrown in from anywhere else that the writer(s) though might be useful) were lounging around one day about 2000 years ago when they decided, as you do, to see what the future held. IIRC, this was at least partly the result of a time loop -- Superman, trying to discover Zha-Vam's origin, was masquerading as a minstrel at their banquet and sang a song in praise of the gods, saying that they would be known forever, and so they decided to see if he was right. Zeus and co. looked in the pool to see what the modern era would be like and saw crowds cheering; much to their horror, though, it wasn't for any of them, it was for Superman. They had been forgotten! Actually, to anyone who knows anything about Greek mythology, the wackiest thing about the entire story was the writers showing that they didn't -- or that much about their own hero! Apart from the expanded pantheon, which could be got around if you really tried, there were some seriously odd moments in the battles between Supes and Z-V. Take, for instance, the moment at which Superman, having arranged for a belt of powers like Zha-Vam's for himself, courtesy of another group of gods who thought Zeus was being an idiot, presses the button which gives him the strength of Atlas, and then grabs Z-V in a (Greek) wrestling hold. Ol' Beardy exclaims that he's in trouble because "he's stronger than me. [...]Hercules never held up the world." Say what? ISTR that, during one of his twelve labors, Herc temporarily swapped places with Atlas (and then had to trick him into taking up his burden again), so Hercules did hold up the world for a while; and regardless of that, this is the Silver Age Superman that we're talking about -- he juggles planets! Heck, when he was Superboy, he moved the Earth by blowing on it! So why the heck does he need Atlas' strength? Ah well, enough of that. Still, I've always thought that the Zha-Vam issues were contenders for Scott Shaw! 's Oddball Comics column. Fun, anyway. Thanks for that Phil... and thanks for reading! 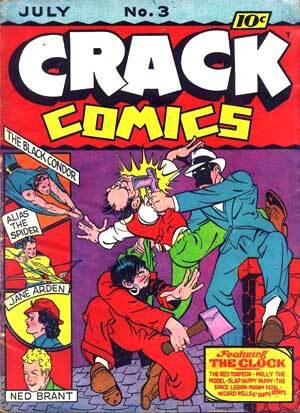 Crack Comics was published by Quality Comics, and issue 1 appeared in 1940. 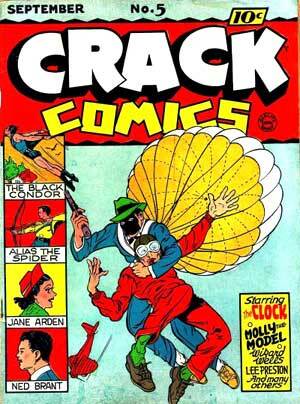 The series lasted 62 issues before it was retitled Crack Western with #63! 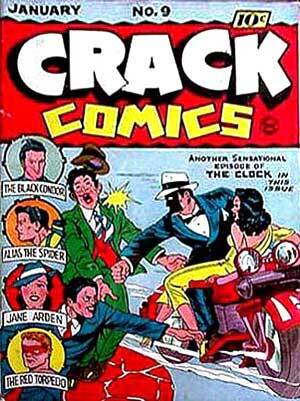 Crack Comics #1 began with a pretty motley group of characters, as you can see by this cover... only the Black Condor would appear to have any staying power! 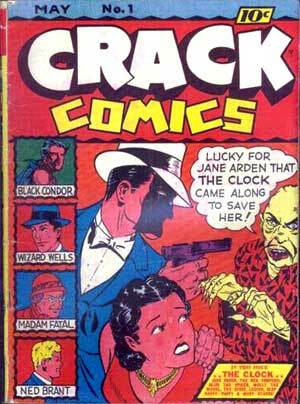 The Clock was one of those many Crimson Avenger/Batman/Green Hornet types that were so common, Madam Fatal was (if I recall correctly) a man dressed as an old woman, and I'm guessing Wizard Wells was a detective of some kind... and Ned Brant was a sports strip feature. 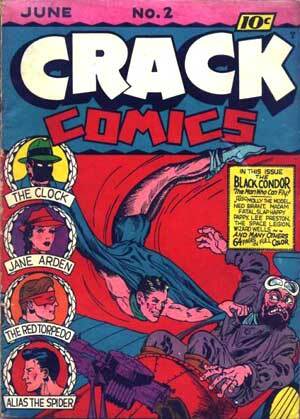 Crack 2's cover is much more eye-catching, although the Condor's cover glory days were still in the figure. Note the addition on this cover of The Red Torpedo and Alias the Spider! 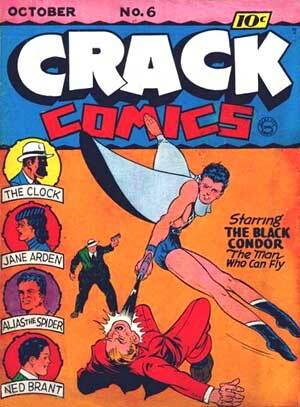 The Spider was one of those golden age archer types, who was actually revived in Starman, I think! At least, he's been mentioned in the last Green Arrow series, or so I've heard. Issue 2's cover was by Gill Fox. Inside, we have The Clock by Brenner; Molly the Model by Devlin; Rube Goldberg's Side Show by Goldberg; Red Torpedo by Kiefer; Ned Brant by Zuppke and E.W. DePew; Lee Preston of the Red Cross by Powell; Space legion by Henkel; Slap Happy Pappy in "He's a Hill-Billy Ball of Fire!" by Fox; Alias the Spider by Gustavson; Jane Arden by Barrett and Ross; Madam Fatal by Pinajian; the text story "Doom Syndicate" by Spain; Wizard Wells in "House of Fear" by Campbell; and Black Condor by Eisner and Fine. Issue 3's cover is even more dynamic... probably one of the best of these first ten! Not only is the cover scene better, but the boxes on the sides stand out more, too! The features and creators in issue 3 are the same as issue 2! As you can see with issue 4's cover, the Clock and the Condor were rotating in the cover positions... and that would continue. With issue 4, Charles Sultan does pencils on Black Condor... but aside from that, the features and creators are pretty much the same as issues 1-3! Kind of hard to believe, but it does look like the entire cover was redrawn with each issue, including the boxes on the side! 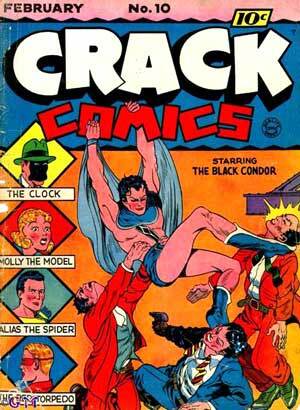 Bad choice to have the Condor, the Spider, and Ned Brant looking away from the magazine on issue 5's cover, eh? In issue 5, Lou Fine did the art for the Black Condor... otherwise, features and creators are the same! 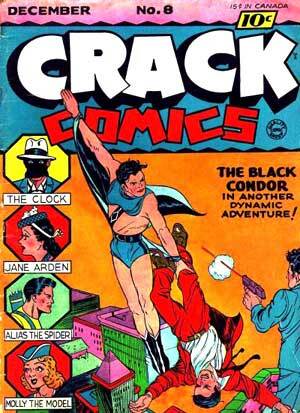 Issue 6's cover is a much better Black Condor cover than the previous two he was featured on, but still not quite so great... heck, his legs look like a woman's legs, which makes me wonder if the art was reworked from something else! Creators are the same here as in issue 5! 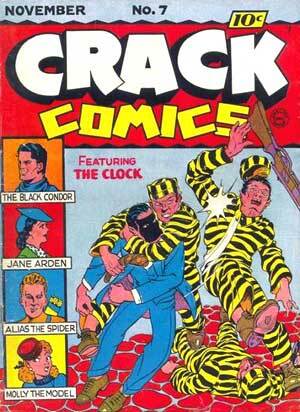 Issue 7's cover, with the yellow and black-striped prisoners battling the Clock, is just plain hard to look at, isn't it? Note the addition on this cover of Molly the Model! Again, the only difference here creator-wise is who drew the Black Condor... this time around, it's Sultan again. The Condor's covers continue to improve with issue 8... but still, the Condor would look better later on! Lou Fine returns to do the interior art on the Condor this issue. Sorry about the lousy quality of issue 9's cover here... rather difficult to tell how good the art is, eh? Inside, it's Sultan art on the Condor feature. And issue 10 finishes off this 1-10 with, as you might expect, the Black Condor again, looking even better than the previous four cover shots! Inside, Lou Fine does the Condor art, but everything else appears to be the same! With that, that finishes off 1-10... and, for the foreseeable future, that finishes off Cover Stories as well. Let's just say that the column is going on indefinite hiatus, okay? Becoming a new father and changing my work shift to be able to spend time with my son has made it difficult for me to find the time for some things, and sadly, this column is one of them. It's possible that I'll return to Cover Stories some day... or I may find someone who wants to take the column over... or this may be the swan song. It's difficult to say! First of all, thanks to Justin, the Webmaster here at World Famous Comics, for running Cover Stories for the past two and a half years here. Thanks to Tony Isabella, whose encouragement got me to approach Justin about this column in the first place! 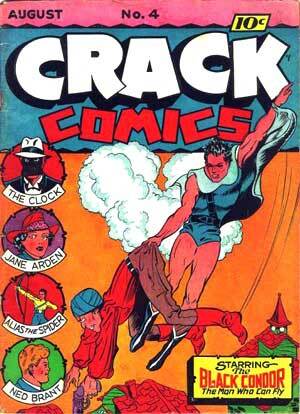 Thanks to the members of the DC-History Yahoo group, where I first presented most of these cover themes. And finally, thanks to you readers who've been checking out Cover Stories each week! I hope many of you will find time to check in on my blog, "Random Acts of Geekery" at http://waffyjon.blogspot.com, which oddly enough I do seem to have time for (not sure how that works). It's been a fun run... but in the words of Groucho Marx, "Hello, I must be going!"